Home » News » Navy’s new jet stops by Oceana. Will it stick around? Two Navy fighters appeared in the distance, flying in close formation toward Oceana Naval Air Station. One of the jets, an F/A-18 Hornet, has for years been a fixture in the skies above Virginia Beach. The other, its future replacement, could be someday. The Navy is still years from deciding whether the F-35C will be based at Oceana, the service’s East Coast master jet base, or whether another, more remote landing field would be more appropriate for its next-generation stealth fighter. That wasn’t the focus Tuesday as an F-35C touched down for the first time at Oceana. Hornet pilots and maintainers – a few of them unaware that the Navy had sent the aircraft from its home base in Florida – crowded along the flight line to get a look at the jet as it taxied off the runway. After it came to a stop, workers rushed to encircle it with yellow rope to prevent journalists and others from getting too close to the test aircraft with their cameras. “Look at that thing,” one Hornet mechanic said, noting the jet’s single engine, pointed nose and dark-gray paint job. “You don’t see that everyday,” another said. “Did you see that?” one of the maintainers gasped when the jet’s tinted cockpit canopy popped open behind the pilot’s head instead of from the front, as they’re accustomed to with the Hornet. “We’re gonna be launching these someday, boys,” said Airman Andrew Wolter of Strike Fighter Squadron 34, before he and his buddies took turns posing for photos. The purpose of Tuesday’s visit was to give sailors in the fleet a chance to see the aircraft in person and receive a briefing from the jet’s flight crew and maintainers. Next week, off the coast of California, the Navy plans to attempt the first F-35C arrested landing aboard an aircraft carrier. The test aboard the Nimitz will be an important step for the F-35, which has been plagued by mechanical problems and cost overruns. 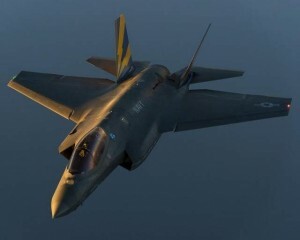 Three variants of the jet, also called the joint strike fighter, are being developed and built, one type each for the Air Force, Navy and Marine Corps. At an estimated $400 billion – well over $100 million per aircraft – the F-35 is the Pentagon’s most expensive aircraft program ever. In a draft report this summer, the Congressional Budget Office slammed the program, questioning whether its technological advancements over existing fighters would be worth the increased cost of building and operating the F-35. Cmdr. John Allison, a former Blue Angels pilot among the elite aviators selected to conduct F-35C test flights for the Navy, spent time explaining some of those advancements Tuesday. The primary advantage: The jet is designed to evade advanced radar systems used by enemies. Just how stealthy is it? Allison also touted the state-of-the-art helmet designed for the jet, which relies on infrared and night-vision cameras to project a 360-degree virtual display on the pilot’s visor. Allison said he can turn his head to look at a target on the ground – essentially lining it up in his crosshairs – then push a button to fire on it. Pilots from Oceana squadrons were eager to discuss the upgrades. Even if next week’s sea trials are flawless, the Navy is a decade or more away from replacing its Super Hornets and legacy Hornets with the F-35C. A number of questions must be answered between now and then, including where the jets will be based along the Atlantic coast. The Navy announced this month that Lemoore Naval Air Station in California will serve as the F-35C’s home on the West Coast. The service still needs to conduct environmental impact studies before deciding where to station the jets on the East Coast, which could take years. The study, expected to begin in 2018, will consider development and noise disturbance in determining the best location to base the jets. A key question likely affecting the outcome for Virginia Beach, which has spent millions to reduce encroachment around Oceana in recent years: Exactly how loud is the F-35C? “It’s comparable to the aircraft that it’s replacing,” said Capt. Scott Anderson, the Navy’s F-35C requirements officer. Although the F-35C was an unusual sight above Virginia Beach on Tuesday, the deafening roar trailing behind seemed as familiar as ever.